In-demand filmmaker Cary Fukunaga (Sin Nombre, “True Detective”) creates an intense, horrifying atmosphere in a war-torn, unnamed West African country and wraps it in a compelling narrative that follows a child soldier rising through the ranks of an evil despot’s child army. 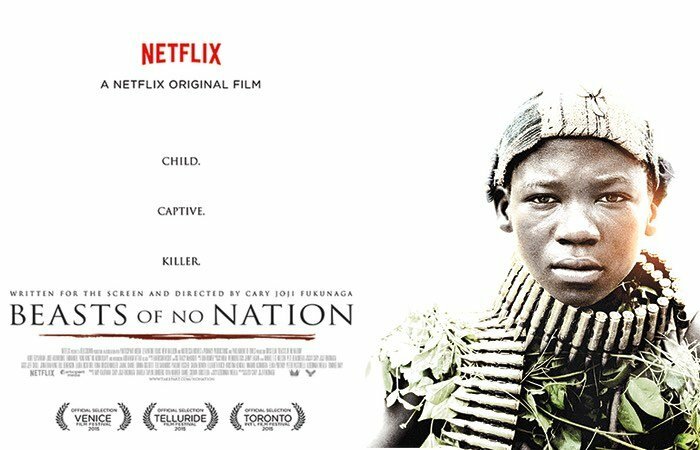 Beasts of No Nation certainly tests its R-rated boundary with depictions of murder, drug use/ addiction, and sexual abuse all involving children. Despite a theatrical release controversy, the film stands as a testament to Netflix’s determination to produce quality content. The film never relents in its brutality. During a weekend with several anticipated studio films hitting theaters such as: Goosebumps, Bridge of Spies, and Crimson Peak, many forget that Beasts of No Nation also debuts. The four major corporate movie theater chains (AMC, Carmike, Cinemark, and Regal) in the United States boycotted showing this nearly-forgotten film due a controversial decision made by Beasts’ primary distributor—Netflix. The Netflix Instant Streaming service decided to make their first major motion picture available to stream on the same date as its nationwide theatrical release. This decision prompted the theater companies to essentially pass on screening the film as they couldn’t possibly hope to financially compete with Netflix. Only independent theaters will play the film on its release date. Writer/ director Fukunaga continues perfecting his technique of utilizing an environment to evoke whatever feeling he chooses for the viewer. His ability to use natural light is on par with Terrence Malick, never relying on a studio or synthetic illumination to serve as a perfect aesthetic for a beautiful land interrupted by horrifying, all-out warfare. Wide shots contain lush, green forest covered in smoke and inundated with gunfire and explosions. 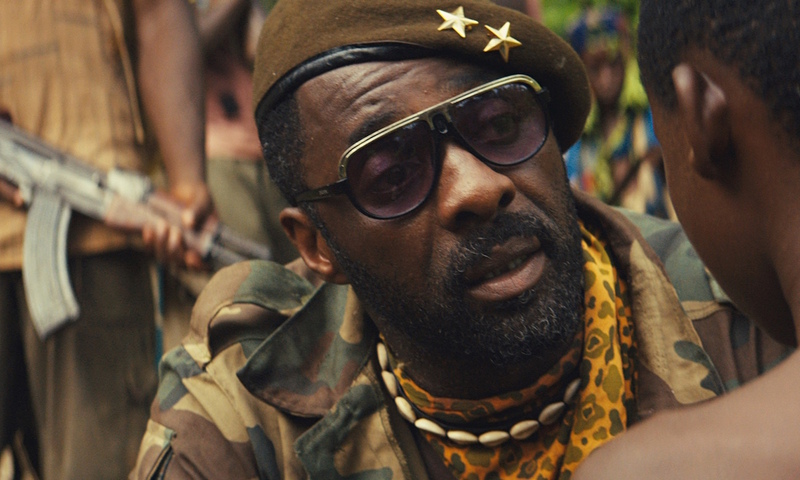 The director recently admitted to “The Guardian” that Beasts of No Nation “eclipsed” directing all eight episodes from the first season of HBO’s “True Detective” in terms of time and money. Adapting the novel of the same title on location in Ghana proved arduous for the cast and crew for a variety of factors, including the fact that cast contained only one trained actor. Fukunaga cast local, inexperienced, Ghanaian actor Abraham Attah to star as “Agu,” the child soldier protagonist. The young adult won the prestigious Premio Marcello Mastroianni for emerging actor/ actress this year at the Venice Film Festival for his hardened, brutal performance as a boy ripped from his family, then forced and indoctrinated into a child militia. Agu’s shameless, vile indoctrinator, The Commandant, is played by British actor/ producer Idris Elba (Pacific Rim, Thor: The Dark World). The director credits Elba, of half-Ghanaian decent, as a key factor in securing a filming location and funding. Elba’s performance takes him to a dark, unsettling place, proving the actor remains an in-demand leading talent. Agu’s journey only gets worse and what little hope he has fades quickly toward a semi-predicable ending. Avoiding to name a specific country turns out a wise filmmaking decision as it allows the viewer to focus more on the story and characters than get preoccupied with global politics while trying to follow a narrative. Despite frustration between major theater chains and Netflix, Fukunaga expertly returns to major motion pictures with a challenging project covering tragic, shocking material. Protagonist and antagonist leads Attah and Elba command the screen as tragic pupil and despicable mentor.